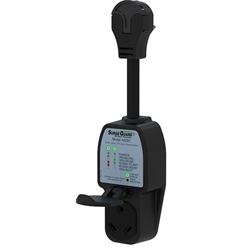 Identifies faulty park power plus offers surge protection. Also analyzes circuits to verify pedestal power. Indicators illuminate to show power status. Tests for and indicates: open ground, open neutral and correct polarity. 2800 Joules of power surge protection. Also, use 30/20 adapter to check 20 amp Circuit. Weather resistant with a NEW rain-proof cover.